Ultrasonic-assisted dyeing as a novel and eco-friendly method was utilized to improve decorative value of fast-growing tree species. The effects of ultrasonic-assisted dyeing parameters (e.g., temperature, dye concentration, ultrasonic power, dipping time, dyeing assistant and dye-fixing agent) on the properties of wood were investigated, and the parameters were optimized. Moreover, the main factors mentioned above were determined with grey system theory analysis. Analyses of chemical structure, thermostability, crystallinity, and microscopic morphologies were conducted using fourier transform infrared spectroscopy (FTIR), thermogravimetric (TG), X-ray diffraction (XRD), and scanning electron microscope (SEM), respectively. Results showed that dye uptake and K/S were influenced by the parameters in the following order: dye concentration > dye-fixing agent > dyeing assistant > dipping time > ultrasonic power > temperature. FTIR indicated that an ether bond was formed between the wood component and the reactive dye. 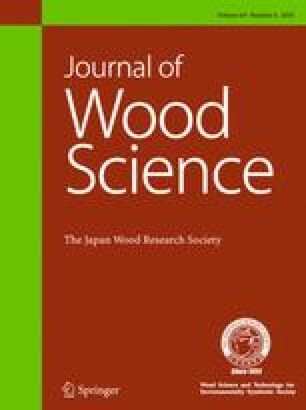 TG and XRD demonstrated that the thermal stability and crystallinity of ultrasonic-assisted dyed wood were both improved. SEM revealed that dye molecules diffused into the cell cavity, wood vessel, aperture, and part of the wood microstructure such as pit membrane, which was mechanically damaged after the ultrasonic-assisted dyeing treatment and created new fluid channels for the dye. This work was supported by Fundamental Research Funds for the Central Universities (no. 2016ZCQ01).